Spanish galleons fighting off Ottoman galleys. Oil on canvas by Juan de la Corte (1597–1660), Naval Museum of Madrid. 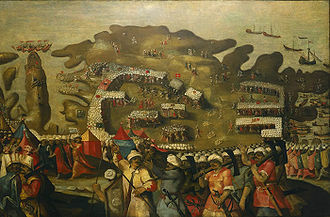 The battle of Cape Celidonia took place on 14 July 1616 during the Ottoman-Habsburg struggle for the control of the Mediterranean when a small Spanish fleet under the command of Francisco de Rivera y Medina cruising off Cyprus was attacked by an Ottoman fleet that vastly outnumbered it. Despite this, the Spanish ships, mostly galleons, managed to repel the Ottomans, whose fleet consisted mainly of galleys, inflicting heavy losses. In mid-1616 a Spanish fleet under the command of Captain Don Francisco de Rivera y Medina sailed from the Spanish Kingdom of Sicily to Eastern Mediterranean waters in order to undertake privateering against Ottoman vessels and ports in the area between Cyprus and the region of Çukurova. It was composed of 5 galleons and a patache. These ships were the 52-gun Concepción, flagship of Rivera; the 34-gun Almirante, commanded by alférez Serrano; the 27-gun Buenaventura, under Don Ínigo de Urquiza; the 34-gun Carretina, commanded by Balmaseda; the 30-gun San Juan Bautista, commanded by Juan Cereceda; and the 14-gun patache Santiago under Gazarra. Aboard the ships were about 1,600 Spanish soldiers, of whom 1,000 were musketeers. 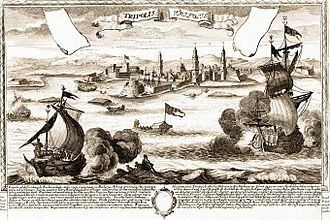 The Spanish fleet sailed to the island of Cyprus, then under Ottoman rule, where Francisco de Rivera ordered that land be sighted prior to initiating of the cruise. During the mission 16 merchant caramoussals were captured by Rivera's fleet off Cape Celidonia, as well as an English privateer in Famagusta and a large number of minor vessels at sea. In addition, ten warships were sunk or burnt in the port of Salinas, whose defenses were also destroyed by a landing party which suffered no loss. The Ottoman governor of Cyprus, who had been rapidly informed regarding the Spanish activities, called for help from the Ottoman navy. Rivera, warned of the relief force thanks to the capture of a merchant vessel coming from Constantinople, decided to wait for his pursuers off Cape Celidonia in order to return to Sicily with a great victory. A Turkish fleet of 55 galleys with about 275 guns and 12,000 fighting men on board appeared off the cape few days later, on 14 July. The battle began at 9 am when the Ottoman galleys moved toward the Spanish ships and opened fire. Previously they had formed up into a huge crescent, designed to encircle the Spanish ships. To avoid his ships becoming separated and overwhelmed individually in the light wind conditions, de Rivera ordered his ships join each other end to end with chains. The Concepción stood at the vanguard, being followed by the Carretina, the Almiranta, and the patache Santiago. The other two ships remained on standby. Their heavy artillery fire kept the Turkish vessels at bay until sunset. The attackers then withdrew to their initial positions with eight galleys about to sink and many others damaged. The attack was resumed the next morning, when, after a night war council, the Ottomans attacked in two groups which separately attempted to capture the Capitana (or flagship) and the Amiranta (or secondary ship). After approaching inside the range of the Spanish muskets, the galleys were subjected to the heavy gunfire of the entire Spanish flotilla. Unable to board the Spanish ships, the Ottoman force withdrew in the evening with another 10 galleys heeling over. That night a new council of war took place during which the Turks decided to resume the action at dawn. After a speech that boosted their morale, the Ottomans attacked with great resolve and managed to approach Rivera's flagship from a more favorable angle in order to exploit her blind spot. Nevertheless, the Spanish commander, who had foreseen such a possibility, ordered that the Santiago move to his ship's bow. This maneuver exposed the Turkish galleys to more heavy gunfire which inflicted severe damage, finally forcing the Ottoman force to withdraw at 3:00 pm with another galley sunk, two dismasted and 17 others severely damaged or heeling over. The Turkish fleet suffered heavy losses, with 10 galleys sunk and another 23 disabled. 1,200 Janissaries and 2,000 sailors and rowers were killed. The Spanish, suffered 34 dead and 93 wounded as well as damage to the rigging of the Concepción and the Santiago, which had to be towed by the other ships. For his success Rivera was promoted to Admiral by King Philip III, who also rewarded him with the habit of the Order of Santiago. The soldiers and sailors of the fleet were also recognized by the Duke of Osuna. Some time later the Spanish playwright and poet Don Luís Vélez de Guevara wrote the comedy "El asombro de Turquía y valiente toledano" ("the wonder of Turkey and the courageous Toledoan") to commemorate the battle. Rodríguez González, Agustín Ramón (2004). 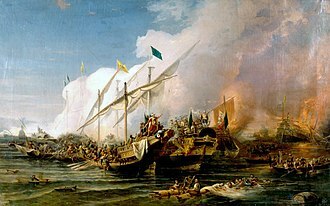 Lepanto, la batalla que salvó a Europa (in Spanish). Spain: Grafite Ediciones. ISBN 978-84-96281-16-5. 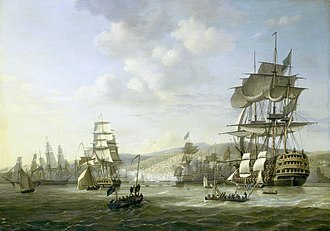 The Battle of Cape Corvo was a naval engagement of the Ottoman–Habsburg wars fought as part of the struggle for the control of the Mediterranean. It took place in August 1613 near the island of Samos when a Spanish squadron from Sicily, under Admiral Ottavio dAragona, the Spanish were victorious and captured seven galleys and about 600 prisoners, among them the Bey of Alexandria and another 60 important Ottoman nobles. Upon his arrival, the Spanish squadron of Sicily had no seaworthy galleys, by July 1612, eight galleys and several sailing vessels had been built following Osunas instructions, the latter being assigned to transport tasks. Osuna trusted the command of this force to the Palermitan Ottavio dAragona. DAragona carried out raids in Ottoman territory, attacking by surprise La Goulette. 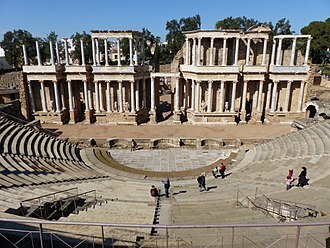 Don Antonio Pimentel burnt seven sailing ships led by an English renegade in the port of Tunis that same year, the major engagement, as well as Osunas biggest victory of 1612, was the rejection in August of a huge Ottoman fleet which tried to capture Messina. Two galleys and three galliots were captured, and a prize coming from Cartagena was recovered, the Ottoman landing parties, isolated from their ships, surrendered to the Spanish cavalry or attempted to escape inland. In mid-1613, dAragona landed 200 musketeers,50 arquebusiers and 100 pikemen in Chicheri, upon dAragonas return, Osuna ordered him to prepare a campaign to face the Ottoman fleet in its own waters. DAragonas galleys were reinforced, each one with 100 muskets,50 spontoons,20 bucklers and 150 chuzos in case it was necessary to arm the rowers to help the soldiers to fight the Ottomans. Osunas flagship, was reinforced with 160 musketeers and seven cannons, Ottavio dAragona set sail to the Aegean Sea in command of his eight galleys. South of Samos, the Spanish Admiral was informed by Greek fishermen of the presence of 10 Ottoman galleys under Sinari Pasha in the surrounding area, after three hours of combat, Sinari Pasha surrendered his galley, and was followed by his second-in-command and five other galleys. The Siege of Klis or Battle of Klis was a siege of Klis Fortress in the Kingdom of Croatia within Habsburg Monarchy. 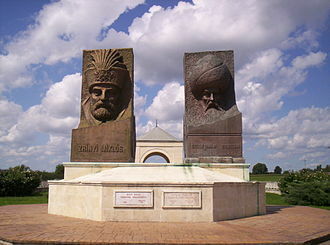 After decisive Ottoman victory at the Battle of Krbava field in 1493, and especially after the Battle of Mohács in 1526, the Croats continued defending themselves against the Ottoman attacks. 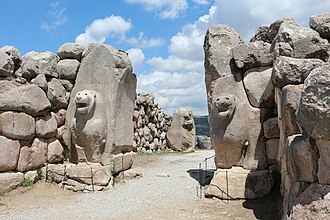 The Ottoman conquest during the years of the 16th century prompted the formation of the Uskoks. As a part of the Habsburg defensive system, Uskoks used the base at Klis as an important defensive position and they fought almost alone against the Ottomans, and for more than two decades defended the fortress against the Ottoman attacks. Citizens fled the town, while the Uskoci retreated to the city of Senj, Klis became an administrative centre or sanjak of the Bosnia Eyalet, and would remain so for a century. 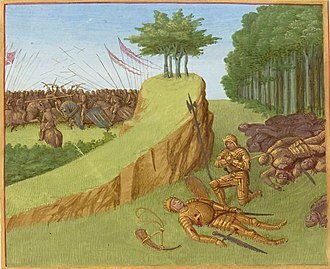 Decisive Ottoman victory at the Battle of Krbava field in 1493, however, it did not dissuade the Croats from making more decisive and persistent attempts at defending themselves against the attacks of the much larger enemy. 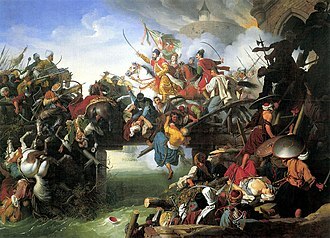 A new wave of Ottoman conquest began in 1521, after which a portion of Croatia was conquered or pillaged. 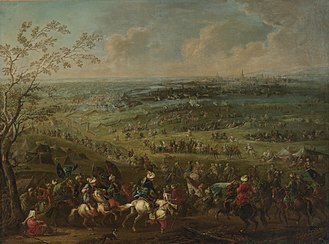 On 29 August 1526, at the Battle of Mohács, the Christian forces led by King Louis II were defeated by Ottoman forces led by Sultan Suleiman the Magnificent. 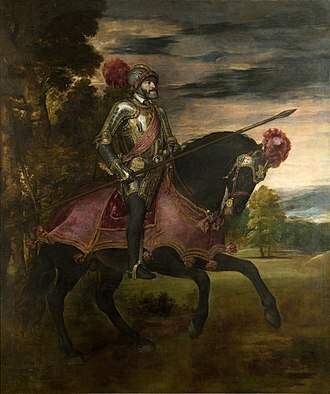 Louis was killed in the battle, which resulted in the end of the independent Kingdom of Hungary as he died without an heir, both the Kingdoms of Hungary and Croatia became disputed territories with claims from both the Habsburg and Ottoman empires. Owing to its location, Klis Fortress was an important defensive position during the Ottoman conquest of the Balkans, the fortress stands along the route by which the Ottomans could penetrate the mountain barrier separating the coastal lowlands from around Split, from Ottoman-held Bosnia. Although nominally accepting the sovereignty of the Habsburg Emperor Ferdinand, who obtained the Croatian crown in 1527, Kružić, from 1513, Petar Kružić was one of the commanding officers of Klis Fortress. The Ottomans attempted to conquer the Klis Fortress on several occasions, the first major attempt was by Skender-beg Ornosović in 1515. The Ottomans captured Klis, a village just below the fortress bearing the same name, Kružić was promoted to captain of the Klis Fortress by the ban Petar Berislavić in 1520. 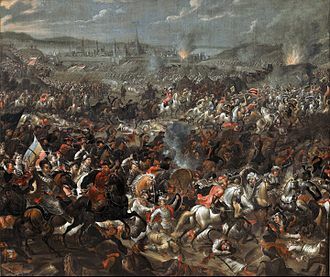 The second major attempt was in 1520, and a year another attempt was made by Makut-paša, with additional 2,000 infantry,50 horsemen, another unsuccessful attempt was made in 1522, by Hasan-paša from Mostar and Mehmed-beg Mihalbegović. 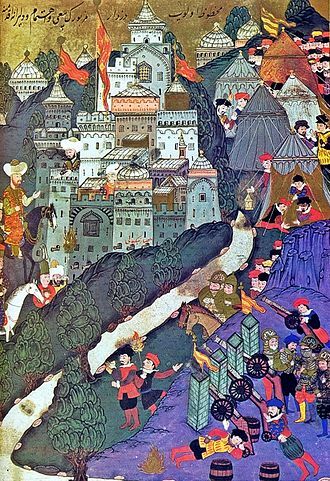 Later that year, Mihalbegović made another attempt at a siege with 3,000 men, during 1523, Klis Fortress was again under attack by the Sultans army. 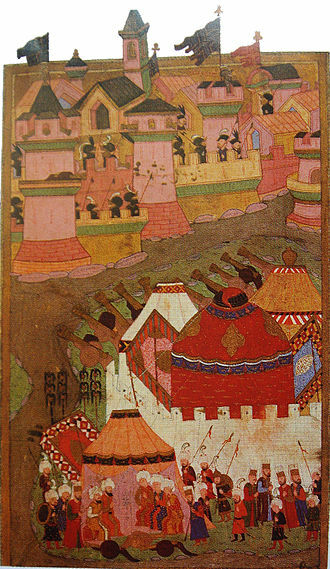 Attempts were made by Gazi Husrev-beg in 1526 and 1528, in 1534, the Ottomans under Mihalbegović laid a months-long siege with a constant concentrated cannonade to the fortress. 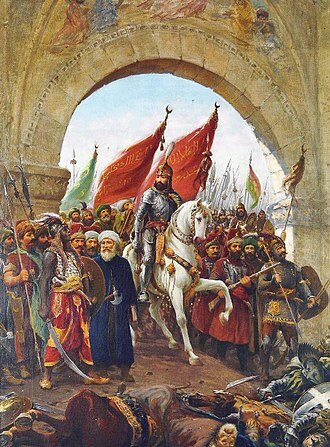 Ferdinand urged the Pope to send ships to relieve the Ottoman siege, although the Ottomans eventually lifted the siege, Ferdinand was displeased that the Pope had provided no assistance in the defense of the fortress. Another possible origin is the Old French word galie meaning galley, from Byzantine Greek galea. 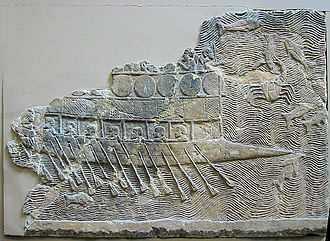 The galea was a warship of the Byzantine navy, and its name may be related to the Greek word galeos, the term was originally given to certain types of war galleys in the Middle Ages. The Annali Genovesi mentions galleons of 80,64 and 60 oars, used for battle and on missions of exploration and it is very likely that the galleons and galliots mentioned in the accounts of the crusades were the same vessels. In the early 16th century, the Venetian galleoni was a new class of galley used to hunt down pirates in the Mediterranean. In Portugal at least, Portuguese carracks were very large ships for their time, while galleons were mostly under 500 tons. One of the largest and most famous of Portuguese galleons was the São João Baptista, there are disputes about its origins and development but each Atlantic sea power built types suited to its needs, while constantly learning from their rivals. It was the captains of the Spanish navy, Pedro Menéndez de Avilés and Álvaro de Bazán, the galleon was powered entirely by wind, using sails carried on three or four masts, with a lateen sail continuing to be used on the last masts. They were used in military and trade applications, most famously in the Spanish treasure fleet, and the Manila Galleons. While carracks played the role in early global explorations, galleons played a part in the 16th and 17th centuries. In fact, galleons were so versatile that a vessel may have been refitted for wartime and peacetime roles several times during its lifespan. The galleon was the prototype of all square-rigged ships with three or more masts for over two and a half centuries, including the full-rigged ship, Galleons were constructed from oak and various hardwoods for hull and decking. The expenses involved in construction were enormous. Hundreds of expert tradesmen worked day and night for months before a galleon was seaworthy, to cover the expense, galleons were often funded by groups of wealthy businessmen who pooled resources for a new ship. Therefore, most galleons were originally consigned for trade, although those captured by rival states were usually put into military service, the most common gun used aboard a galleon was the demi-culverin, although gun sizes up to demi-cannon were possible. An Ottoman raid of the Balearic islands was accomplished by the Ottoman Empire in 1558, against the Spanish Habsburg territory of the Balearic islands. The Ottomans had already attacked the Balearic Islands many times previously, followed the sacks of Pollença, the Sack of Mahon in 1535, Alcúdia, Andratx, and Sóller. Ottoman attacks only decreased after the Battle of Lepanto in 1571, through the services of his ambassador Jean Cavenac de la Vigne, Henry II obtained the dispatch of an Ottoman fleet in 1558. Suleyman the Magnificent sent his fleet as a diversion to help his French allies against the Habsburgs, the Ottoman armada left Constantinople in April 1558. 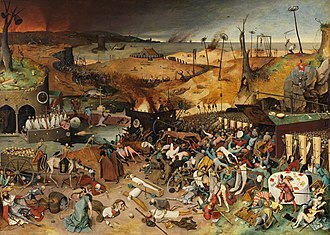 On June 13,1558, the Ottoman fleet ravaged Italy, with little effect however apart from the sack of Sorrento, part of the possessions of Spain in southern Italy, in July, the fleet started to ravage the Balearic islands. The Ottoman force consisted of 15,000 soldiers on 150 warships, the Ottomans, after repulsing an attack on Mahón, attacked the citadel of Ciutadella in Menorca, which was only garrisoned with 40 soldiers. The Cittadella of Gozo today.